2014 Infiniti Q50 priced slightly less than the outgoing G37. The weak engine is killed off and there is now a powerful hybrid option. Infiniti announced today the starting prices of the new Q50 sedan which replaces the G37. The apparent base price is now lower than the current model G37.. The 2013 G37 starts at $37,300 not including its destination charges and dealer documentation fees. In an effort to undercut BMW (and itself) the new 2014 Q50 starts at $ 36,700.00. Infiniti has also changed up all the model trims for the new Q50 in comparison to the 2013 G37. Gone are the Journey, X, and Sport trims. Now we have Q50, S, which means Sport, and Premium. 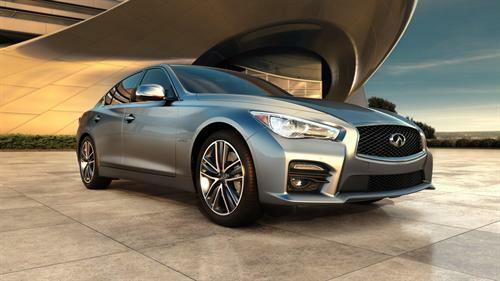 Although Infiniti released a price matrix for the 2014 Q50 it is not yet possible to use it to determine pricing since Infiniti has not made clear what is included in the pricing. From what we can tell, the Premium does not include navigation and such things, which is senseless. They are options that are always added. Thus, trying to match up base prices in comparison to a BMW equivalent will have to wait a bit longer. However, we can report that the low powered 2.5 liter engine in the G37 is now gone, replaced with the new 3.5 liter Hybrid in the 2014 Q50. Therefore, there are the two six cylinder engines, and both have a 7 speed automatic transmission. The 3.7 is carried over from last year, and the 3.5 hybrid is a newer engine. Lexus recently reduced its pricing on the all new IS250/IS350 line. Like Lexus, the Infiniti line is available either rear, or all-wheel drive. Both companies seem intent on making a stronger push towards capturing market share from BMW's 3 Series than in the past. On paper at least the two seem to have more power, more space, more options for the money, and competitive or superior fuel economy. Writers have started to drive the Lexus IS line and the reviews are very positive. Although Lexus has opted not to sell its hybrid IS here in the US this year, we bet it will next year. For hybrid compact sports sedan shoppers it seems that there will soon be two options in the US market. 2018 Infiniti QX30 Luxury vs. Honda Civic Hatchback EX-L Navi - Which is the better 5-door car? New Infiniti QX30 Looks Cool But Can You See Out? What Will the U.S. Infiniti Q30 Look Like?